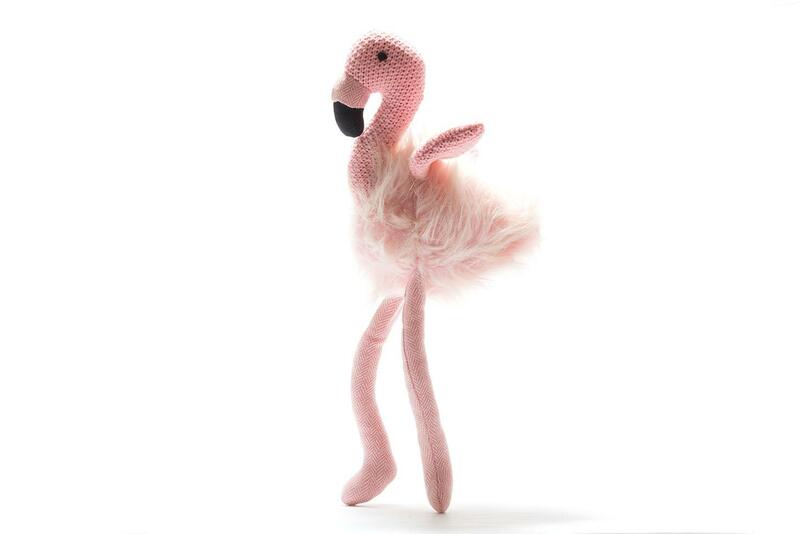 Tweed pink legs, long fluffy body and inquisitive face make this a very charming flamingo toy. A recent survey by a hotel chain claims that up to 35% of British adults still take their favourite cuddly toys to bed with them. They also shared their problems with their favourite childhood toy and cuddled them when upset. I’m not sure how seriously to take the survey as it also claims that 25% of British businessmen take their teddy bears with them on business trips, but if you are going to take a toy in to adulthood with you then this flamingo toy has everything you need. •	Tactile knitted fabric and long swinging legs. Approximate dimensions: 40cm long from feet to head, 23 cm from body to head and 20cm in length. Machine washable - just fluff the fabric once dried! Made from acrylic.